The story follows Spencer Shelton, who calls himself Spade. He is an older but no less sophisticated or capable individual who just so happens happens to be a career criminal and bank robber. One notable difference between Spade and many other characters in this genre is that he relies on his charm and quick wits to ply his trade, rather than resorting to the use of guns or violence. However, despite Spade’s resourcefulness, he has, as we discover at the beginning of the story, found himself captured and imprisoned in a maximum security prison. This leads to an inevitable escape for Spade and some of his prison allies. Once he’s out however, he proceeds to round up his old gang who all have code names based on suits of playing cards (Diamond, Heart, and Club). Together, Spade and his gang make plans to pull off a series of complex robberies that will sees them runs afoul of some of the most powerful mob bosses in New York City, led by Vito Accardi. Accardi is involved in a quest to bring Spade and his cohorts down by any means necessary. Spade makes mention during the story of other people who have previously held the code names now shared by the current members of his crew. This would lead you to believe that the events of this book are not new to Spade and that he has a long history of pulling off such capers with a variety of different criminal associates. I really enjoyed the fact that there was some implied history between the members of Spade’s crew as it helped to make these characters seem deeper from a storytelling perspective. It also reminded me of the Rogue’s that appear in the Flash comics and their unique moral code regarding robbery and murder. Also entangled in this web of deceit is Detective Wells of the NYPD who is a bit of a bumbling but goodhearted cop who is determined to redeem himself by catching the notorious Spencer Shelton in the act and returning him to prison. Most of the conflict in this book is leveraged between Spade and his mobster enemies with Wells stuck in the middle. It reads a lot like Ocean’s 11 or The Italian Job (the Mark Whalberg version) mixed with a variety of different comic book influences. During the events of the book, we get to see Spade and his crew successfully pull off several great capers, not always with ease, but definitely with flair. They are a grittier crew than most and frequently find themselves in difficult situations that require an immediate need to improvise a solution. Being that the story involves criminals, there is a small bit of violence involved, so this book may not be considered appropriate for all audiences. Just because Spade and his gang don’t kill people doesn’t mean that their enemies won’t. Having said that, the violence in this book isn’t too bad, bar a few particular panels. 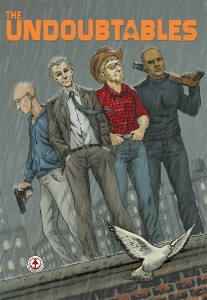 If you are anything like me and you enjoy crime books, then The Undoubtables is a comic that you will definitely want to check out. Parental Concern: The violence is pretty mundane but I would recommend it for the 13+ crowd.